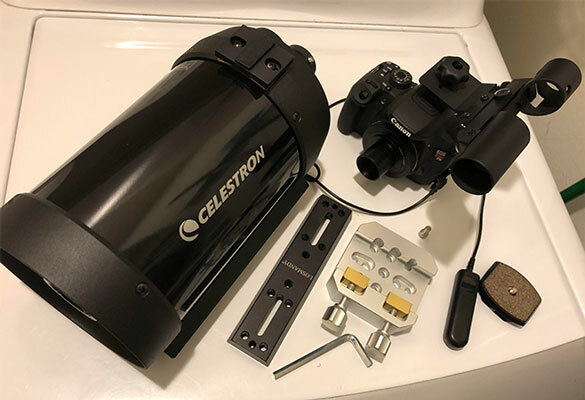 Well the super moon and lunar eclipse have come and gone, but let's break out the old C5 spotting scope and see if we can get a little more resolution than possible with the 300mm DSLR telephoto. You may recall that we first described the C5 spotting scope back in the post of September 16, 2016 and that it has a great 127mm aperture with 1250mm focal length, all in a small package of only 6 lbs. Much easier to carry around than a real telescope and rather than set it up on a regular tracking mount, I elected to just use my camera tripod. It took some kludging together of several adapters to mate up to the tripod, but it worked. Check out all of the adapters used to do it! There is an adjustable clamp to count on the C5 rail and a separate bar with 1/4" - 20 threaded holes, which then the tripod shoe could be screwed onto. Also, since I have been mostly using the 80mm refractor telescope with a 2-inch optical tube, I had to find a 1-1/4 inch tube adapter for the C5 and the camera T-ring. Ok, with all of the hardware kludged together, all we have to do is wait for the clouds to clear. Finally, the moment has come. The C5 and camera, mounted on the flimsy, light weight DSLR tripod, was hard to focus in that any slight touch to the focus knob would send the image bouncing back and forth and up and down. 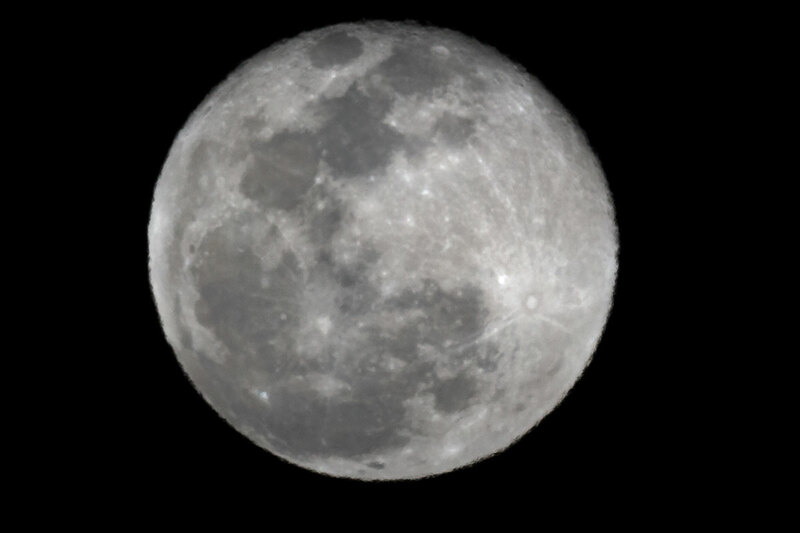 Anyway, after several trials and attempts, I managed to get this image of the post full moon. 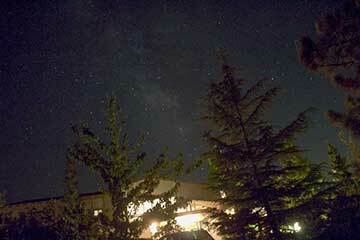 Next time, I probably should use the heavier weight camera tripod and do image stacking to clear up the image a bit. But, for now, I'm not much of an image stacker, so this image will just have to do! The weather does not always cooperate with the astronomers so it is always good to keep an eye on the weather forecasts. One example of special significance right now, as Resident Astronomer Peggy and I plan and pack for our upcoming cruise above the Arctic Circle, is the weather up in that region. 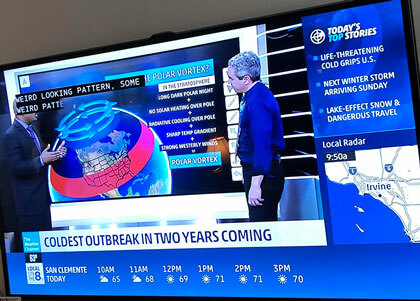 So now we see this discussion about the so called Polar Vortex, which is projected to bring very cold weather to us in the next couple of years. 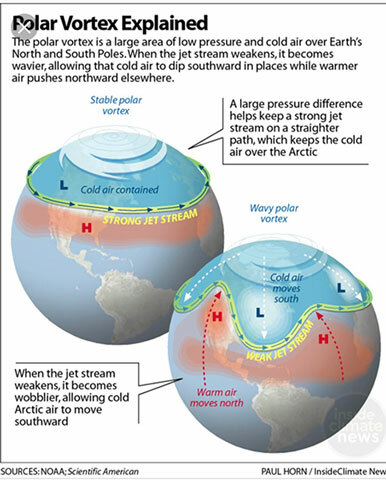 So what is the polar vortex and how does it bring cold weather from the arctic down to the rest of us? Hmm, it seems it is something like a large low pressure area of cold air, at both the north and south poles, that weakens the jet stream, which allows the cold air to drop down to the rest of us. So, as if the Polar Vortex is not bringing enough cold weather down to us, we are planning a winter ocean cruise up the coast of Norway in search of the northern lights and maybe even pretend to be searching for the polar vortex too! The western northern coast of Norway, with many fjords, should be very scenic; if we can make out the shoreline though the snow and clouds and very few hours of sunlight available at this time of year. 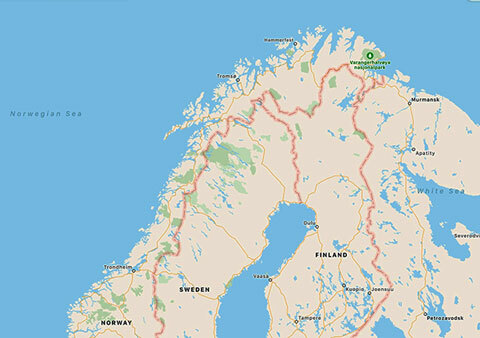 We will cruise from Bergen up to Tromso and through the supposedly very scenic fjords up to almost Hammerfest. Tromso, at around 69 degrees north latitude is located above the arctic circle. So if the polar vortex cooperates and the clouds and snow don't get in the way, we hope to have good observation of he northern lights. 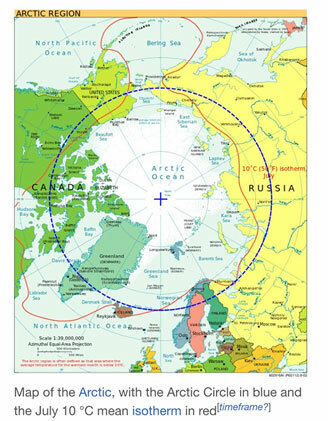 The Arctic Circle is shown in the image below and you can see how it touches and crosses portions of Russia, Alaska, Canada, Greenland and the Scandinavian States. The Arctic Circle is currently about 66 degrees north latitude and is moving northward at about 15 meters per year. Hmm, I guess that means the Arctic Circle is shrinking and getting smaller? Well, yes, but remember the Earth's wobble does not keep increasing and goes up and down on cycle of thousands of years. Just in case, you don't remember the technical definition, and I had to look it up too, but we can easily find on Wikipedia that "it marks the northern most point of which the centre of the noon sun is just visible on the December solstice and the southern most point at which the centre of he midnight sun is just visible on the June solstice." Ok, ok, if you want to stay inside in your warm armchair, check out this excellent video on dark matter and dark energy and the ongoing collaboration between experimentalists and theorists in trying to explain the ongoing debate. If dark matter is a particle why hasn't it been found after all of these years of searching? Is dark matter the fundamental constituent of the universe and all effects attributed to dark matter nothing by a side reaction between dark energy and normal matter? There are numerous theories of dark matter, all having enough free parameters that no matter what the experimentalists find, the theorists can adjust their parameter knobs to explain all results. Are we in a declining scientific age where the null results of some experiment cannot be used to rule out a particular theory with many free parameters? 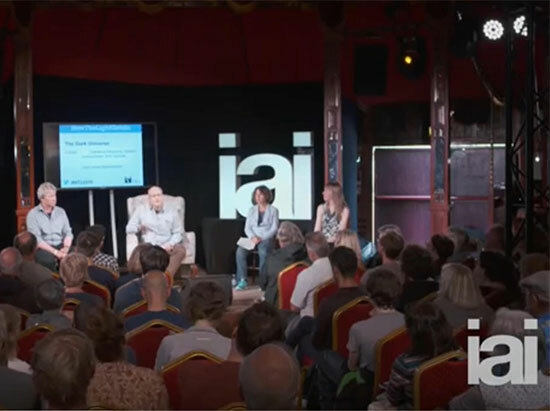 Good discussion on the philosophy of science and interaction between experimentalists and theorists.